Drought, but not frost tolerant, Echeveria elegans is commonly called the The Mexican Snowball. 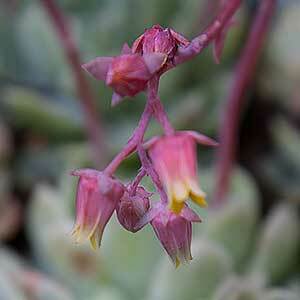 A low growing succulent with attractive foliage, this plant makes a great Echeveria to start with as it is easy care. The leaves are best described as a pale silvery to white green, the plant itself only reaches around 10 cm in width and 15 cm across, and forms a neat rosette. As it puts out the offsets it will spread more, and you can grow them in groups, or divide them to keep them as single specimen plants. In cooler weather the plant will put on a bit of display by the tips of the leaves turning to a pink to red. Given a well drained soil and a position in good morning light with some afternoon shade in hot climates this is an easy care, no fuss plant. Simply water when the growing medium drys, fertilise a little once a year, and repot every 2 – 3 years. 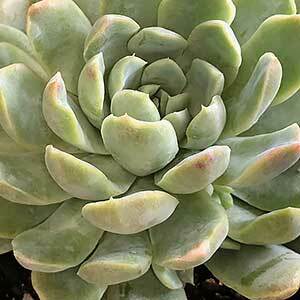 The major problems with Echeveria elegans are caused by over watering or by high humidity. This can cause fungal diseases and root rot. Other issues are caused by a lack of light which can cause elongation of the leaves as well a poor colour. Propagation is from leaf cuttings or by division of the offsets. Common Name – The Mexican Snowball, Hen and Chicks. Growth rate – Medium tp fast. Foliage – Pale silvery green. Flowers – Small orange to pink flowers with yellow tips.